The plastic envelope and pockets are both 1 mm thick. Don't let papers clutter your desk in a messy, unbearable pile any longer. With our Expanding Files, you can organize all your documents, so you can finally see the wood, metal, or plastic that covers your desk again. 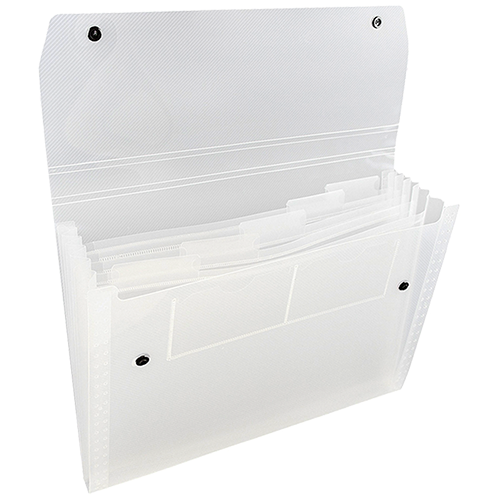 Letter size folders are the key to a happy, clean workspace! These accordion folders are the perfect size for standard sheets of paper, making them great for both the home and the office. With both 6 pocket and 13 pocket varieties available, you can choose the perfect amount of organization that you need to get the job done. And with a variety of colors to choose from, your office can still look stylish! With our strong, durable plastic build, your papers will always stay safe and secure inside. Stylish AND strong? Accordion Folders measure 9 x 13 and are available in 6 Pocket & 13 Pocket. 13 Pocket Accordion Folders are available in: Black, Blue, Clear, Red, and Smoke.